During my two years stay here in UK, I had the privilege to visit some locations that were used and featured in my favourite films. Here’s the initial list. Oxford University Christ Church College’s dining hall was used as Hogwarts dining hall during the sorting ceremony in the Harry Potter and the Philosopher's Stone film. At present the dining hall is still used for meals by students of this famous Uni. Also in the first Harry Potter film, as the new first-years enter Hogwarts they are greeted by Professor McGonagall. That scene was shot on this enchanting staircase that leads to the Christ Church College’s dining hall. Christ Church is open to the public most days of the year. Some Braveheart scottish scenes were filmed in and around Glen Coe, one of the many scenic places in Scotland. As in the book, Robert Langdon (Tom Hanks) and Sophie Neveu (Audrey Tautou) in the The Da Vinci Code film have to look for the tomb of Sir Isaac Newton, which is located in a niche on the north side of the nave of Westminster Abbey. In the film the facade of Westminster Abbey is featured but Lincoln Cathedral was used as a double after Westminster Abbey officials refused to allow filming to take place inside. In the film Bridget Jones's Diary, Bridget (Renee Zellweger) on her way to work goes through Picadilly Circus. 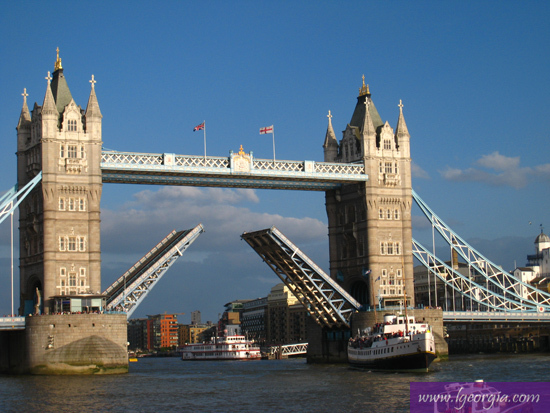 The next scene of the film shows her crossing Tower Bridge, as if it is over the road. This is obviously a mistake as this can take an hour (with my short legs) to walk that far, from Picadilly Circus to Tower Bridge. Notting Hill is a romance comedy film about a famous Hollywood star Anna Scott (Julia Roberts) who falls for a mild-mannered, simple English bookseller William Thacker (Hugh Grant). In the film William is the owner of the down-at-heel Travel Book Company on Portobello Road. That bookshop does not exist but however a real bookshop, the inspiration of William’s shop in the movie, can be seen just around the corner. It’s The Travel Bookshop located at 13-15 Blenheim Crescent, just off Portobello Road, Notting Hill.